조선 후기 백자 항아리로 적당한 높이의 아가리에 어깨부분이 불룩하고 아래로 갈수록 서서히 좁아지는 모양이다. 크기는 높이 30.8㎝, 입지름 15㎝, 밑지름 16.4㎝이다. 직각으로 올라 선 아가리 둘레에도 무늬를 두르고 몸통에는 능숙한 솜씨로 포도 덩굴을 그려 넣었다. 검은색 안료를 사용하여 그린 포도 덩굴의 잎과 줄기의 생생한 표현으로 보아 도공(陶工)들이 그린 그림이 아니라 전문 화가들이 그린 회화성이 짙은 그림임을 알 수 있다. 몸통 전면에 푸른색이 감도는 유백색의 백자 유약이 고르게 칠해져 있는 이 항아리는 이화여자대학교 박물관에 있는 백자 철화포도문 항아리(국보 제107호)와 함께 조선시대의 대표적인 백자 항아리이다. 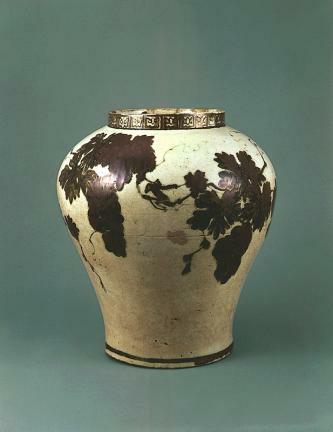 Made during the late Joseon period, this white porcelain jar has height of 30.8 centimeters, mouth diameter of 15 centimeters, and foot diameter of 16.4 centimeters; it is characterized by a voluminous body with broad shoulders gradually narrowing toward the base. There are a large grapevine motif brushed around the upper body in dark iron red and a band on the outside of the upright mouth. The firm, unrestrained brush strokes depicting the vine and fruits so efficiently and beautifully suggest that the painting was made by a professional artist rather than the potter. 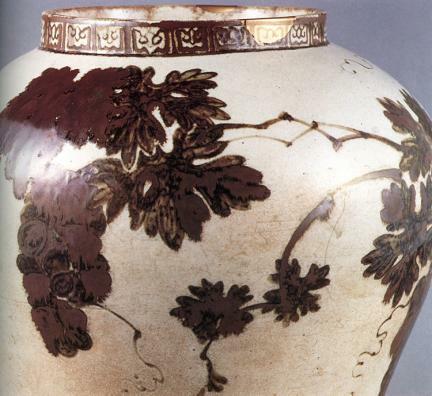 With the milky white glaze with light blue tint evenly coating the entire body, the jar is often regarded as one of the two greatest masterpieces representing the artistic achievement of the white porcelain ware of Joseon, the other being the White Porcelain Jar with Grape Design in Underglaze Iron (National Treasure No. 107) currently stored in the Ewha Womans University Museum in Seoul.